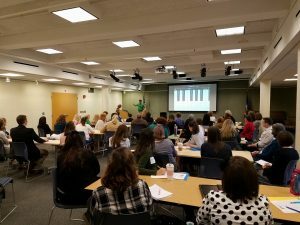 Mr. Matt offers a fantastic Sensory-Storytime Professional Development for librarians, administrators, parents and teachers. The entire lecture can last anywhere from 1 to 3 hours depending on your timing needs. Librarians will benefit from the engaging material, hands-on activities and take-home materials. AutismFriendlyShows has developed their guidelines through graduate work and through our experience working with thousands of children and teens with developmental disabilities. We have crafted this lecture with hundreds of librarians from a variety of county-wide systems including New York Public Library, Somerset County Libraries (NJ), Suffolk County Libraries (NY), Connecticut Public Libraries, Berks County Libraries (PA), Albany Public Libraries (NY) and many more. We believe that all children deserve access to engaging programs and this is especially true for children and teens with developmental disabilities. We believe that the local library is one of the best places to offer these types of programs. Are you interested in finding out about exciting music technology apps and websites that your library patrons or students can use for STEM/STEAM learning opportunities? “Mr. Matt” Mazur is the director of Turtle Dance Music, LLC (“We Help Kids Come Out Of Their Shells!) and AutismFriendlyShows.com. He is also the music teacher for Adults and Children With Learning Disabilities. We will share incredible new apps and websites for making music with your classroom students and staff, library patrons, and families. This will be a hands-on demo with fun and exciting music making challenges for all participants. Please feel free to bring your own iPad, iPhone, laptop, tablet-device, silliness and “Yes, and . . .” mindset. The goal of the presentation will be to empower all teachers, librarians and parents to empower their students or patrons with technology – especially teachers, librarians and parents who do not identify as “tech savvy”. A Q and A will be held at the end of the presentation.